Rogue Valley Microdevices CEO/Co-Founder Jessica Gomez has long been an advocate for corporations engaging in vital community programs such as STEM education. 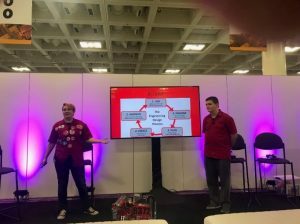 That’s one reason why Rogue Valley Microdevices supports meaningful STEM education programs in Oregon, including high school robotics, middle school STEM initiatives, and SEMI’s High Tech U, a three-day conference held at SEMICON West 2018 to which the company brought two Southern Oregon-area high school students. Curious about the status of STEM education in the US at large, Gomez considered one barometric measure: how are US students doing in standardized testing in STEM subjects relative to same-aged students in other developed nations? The answer is: not great. Rather than daunt electronics industry companies, argues Gomez, it should inspire them to action. Gomez’s post on the subject was published in SEMI Blog – the blog of the global semiconductor industry. Read more.